Back to the Roots, an Oakland, California-based organic food company, expanded its crowdfunding campaign on CircleUp into a $10M Series A funding. The new investment was led by Acre Venture Partners and also includes funding from S2G Ventures and Red Sea Ventures. The company intends to use the funds to accelerate product development, scale distribution within the retail and education sectors, and continue growing the team. 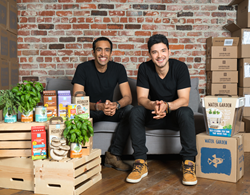 Founded in 2009 by Nikhil Arora and Alejandro Velez, Back to the Roots is an organic food company currently selling products in over 14,000 stores worldwide, including Whole Foods Market, Target, Costco, The Home Depot, Nordstrom, Petco, Cost Plus World Market, Loblaw, Giant Eagle, Wegmans, The Fresh Market, Crate & Barrel, Urban Outfitters, Safeway, Kroger, and Amazon. This spring, Back to the Roots has launched five additional products. In its Ready to Grow line, the company introduced three varieties of Garden-in-a-Jar — a windowsill planter in a mason jar format that allows families to watch the roots as they grow. Additionally, the brand launched an Organic Self Watering Tomato Planter, offering a low-maintenance solution to indoor tomato gardening using ancient “olla technology”. Finally, it extended the Organic Stoneground Flakes cereal line to include the new Biodynamic® Cinnamon Clusters, a Biodynamic cereal.